The video above is of my 1995 Ultimate Warlock 210 LXI, powered by a marinised 2005 “LLY” 6.6L Duramax diesel. 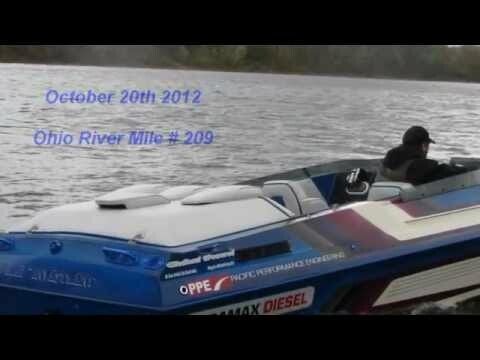 Over a dozen back to back kilo style runs were recorded that day to promote biodiesel as an alternative marine fuel. The runs were made on B100, a 100% pure biofuel made from vegetable oil. Speeds were certified by twin on-board GPS units, and K-band radar by a local police chief. While I would love to take credit for conceiving the first Duramax marinisation, credit belongs to the guys at California based tuner Pacific Performance Engineering [PPE]. Back in early 2007 they started rigging this Warlock hull with a Duramax engine salvaged from a 3/4 ton GMC truck. Later that year the boat was featured in Diesel Power magazine, and displayed at SEMA in Las Vegas. After participation in a west coast marine endurance race, the boat was sold to a local customer of PPE. According to the Duramax forums, it was spotted a couple times the following year on lakes in California and Arizona. In the fall of 2009 I stumbled onto it listed on eBay, and thought it would be good fit for my biofuels business. Shortly after purchasing the boat, it was nothing but trouble. Hence the name, “Bad Investment”.. Little things at first, like electrical bugs, blown turbo boots, fuel starvation problems, and a couple minor cooling issues. That July while attending an SBI race in Florida, she spun a rod bearing and trashed the crank. The crankshaft was repaired, then only a couple weeks later it cracked a piston. This all within the first 30 hours on the meter. And I began to consider scrapping the Duramax platform. 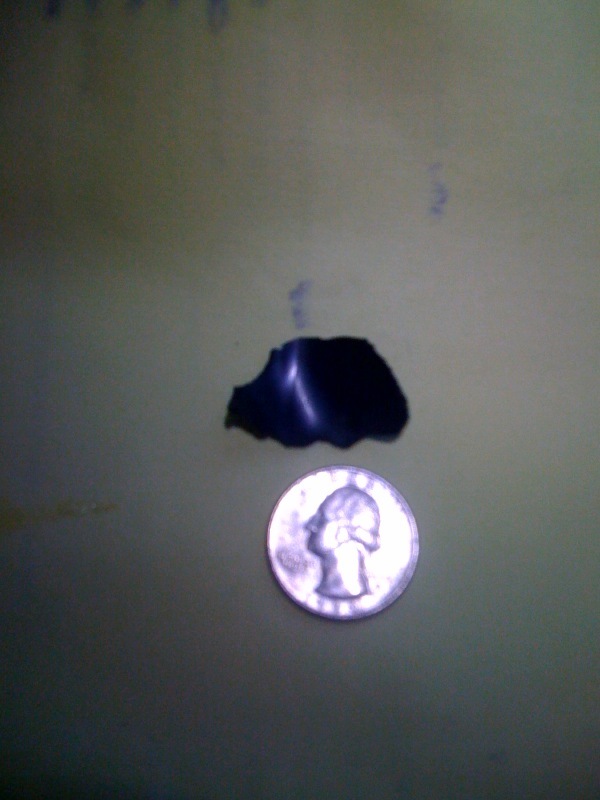 A small piece of rubber (pictured left) from the oil cooler and remote filter lines had broken free and was lodged in a main passage of the block. Starving the engines oil flow, while maintaining normal oil pressure on the gauge. It was stuck so far up in the block, two different machine shops missed it when they’d cleaned and inspected after the previous failures. Seems the stab type AN fittings used in the original rigging job are known to cause this “liner pealing” issue. All oil system lines were replaced, using only crimp style hydraulic fittings. By the time we found this oiling issues, I’d already decided to upgrade several features based off advice from well respected Duramax gurus. What went back in the boat was a true 800hp capable bottom end. With upgraded oiling, fueling, major airflow improvements, and on-the-fly selectable power levels via EFIlive DSP5 switch. It was now a solid engine platform, engineered to handle the rigorous marine environment. After a proper engine break in and a some final rigging adjustments, she was ready to go. And go she did. Her maiden voyage was a 15 mile wide open run down, where it held together spinning 600 RPM’s above factory red line for 10 minutes straight. All the hours addressing the engines weak points looked to have finally paid off. Now it was time to fine tune parameters and take her on the road. Over next three years we logged over 300 problem free running hours. Boating on every major Eastern body of water between Canada and Florida. Did a few poker runs, shootouts, volunteered as a rescue boat for SBI, and even crossed two of the Great Lakes in this 21′ open bow. Not only is she respectfully fast reaching up to 86mph, she is more amazingly fuel efficient. Offering A cruising range of over 350 miles on a 82 gallon tank. 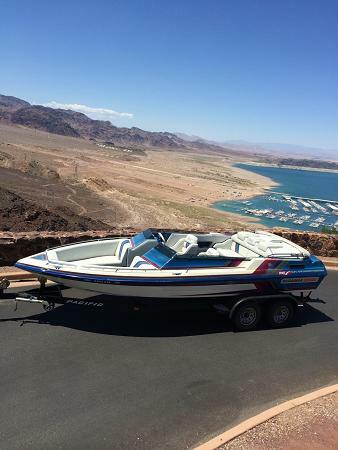 My last ride in her was the fall of 2014 on Lake Mead Nevada, where she was handed over to the present owner and returned to California. This was definitely a learning experience, but it demonstrated the Duramax is a very solid platform when properly rigged. While attending the 2013 Lake Cumberland poker run, I was approached twice by individuals who knew the boats history well. They both worked at GM’s Duramax engine assembly plant in Dayton Ohio. Each told me about how a picture of my boat proudly hangs on the wall in one of the break rooms. That’s when I realized, all the time and money spent working through those bugs was well worth it. 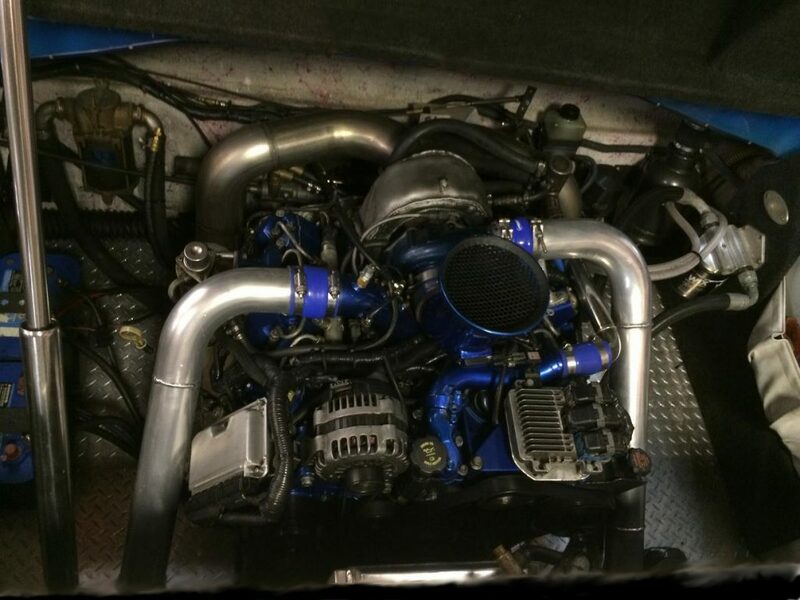 That first Duramax powered boat received plenty of recognition over the years. Featured in multiple print and online articles, along with tens of thousands views on YouTube. She’d also proven going green can be cool. Logging the majority of engine hours burning extremely clean biodiesel. Yes it was an expensive endeavor, but in the end it’s performance quickly became legendary. Proving 409 cubic inches of marinised V8 diesel power can turn heads. It’s also inspired at least 10 more Duramax conversions that I’m aware of.